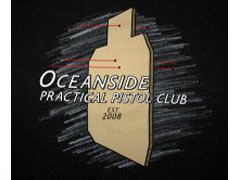 Oceanside Practical Pistol Club is a USPSA (#IPSC67) and an IDPA (#C0583) affiliated shooting club located in northern San Diego county, serving shooters in San Diego, Orange, and Riverside counties. In addition to monthly USPSA and IDPA matches the club hosts weekly fun matches at our home range - Iron Sights Indoor Shooting Range in Oceanside, California. We welcome shooters of all levels. Find out more by clicking on the Match Info link in the menu above. Our goal provide at least one opportunity per month to safely practice and hone our shooting skills with real world carry guns according to USPSA and IDPA rules. To help with that goal we run a variety of weekly matches that allow shooters of all levels to get involved. We are committed to real world courses of fire and doing all we can to see that everyone has a safe, enjoyable time. We strive to work around the schedules of other regional clubs to maximize your shooting opportunities and to work with those clubs to spread the word about local matches. Be sure to check out our Match Info and Calendar pages for more details. Helpful links (Note: some link to external web sites).